« Finally Got More Details on My 1959 Les Paul Replica! Not sure how I feel about this one. But here’s a press release I got from Fender yesterday. SCOTTSDALE, Ariz. (March 20, 2014) – Fender is proud to announce it will offer fans collectible MLB-themed electric guitars that sound as great as they look. 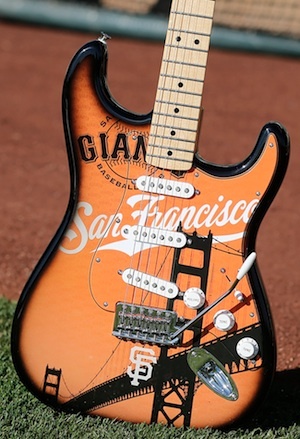 Each Fender Stratocaster® guitar will feature official team logos along with custom designed landmark imagery unique to the team’s market, as well as a “MLB” logo adorning the neck plate. The initial group of team guitars available in 2014 includes the Arizona Diamondbacks, Boston Red Sox, Chicago Cubs, Detroit Tigers, Los Angeles Angels of Anaheim, Los Angeles Dodgers, Milwaukee Brewers, New York Mets, New York Yankees, Philadelphia Phillies, St. Louis Cardinals and San Francisco Giants. Also available is a Minnesota Twins All-Star Game guitar that features unique Minnesota imagery in honor of the team hosting the Midsummer Classic in 2014. In addition, each guitar features an alder body, maple neck with a modern “C”-shape and 21 medium jumbo frets, three standard single-coil Strat®pickups, six-saddle vintage-style synchronized tremolo, five-position switch, master volume and tone knobs, and standard gig bag. Fender and MLB officially launched their relationship during the 2013 MLB All-Star Game at the New York Mets Citi Field by selling limited edition MLB All-Star Game Stratocaster guitars. Now, baseball fans throughout the United States can craft their own rock ‘n’ roll classics while representing their favorite MLB teams. These instruments will be available to U.S. consumers only beginning March 31 exclusively at http://www.fender.com/mlb and http://www.shop.mlb.com, as well as in team shops at select MLB ballparks. Don’t know what price point these will come in at. I guess we’ll see when they get released on March 31. Definitely not something for me. Even though it’s a Strat, to me it’s akin to that leg lamp from the movie “A Christmas Story.” I suppose if you’re a big fan of particular team and a guitar player, you’d want one of these. But for me, as much of a Giants’ fan I am, I don’t ever see myself toting this one on my shoulder.